Cobra makes aftermarket parts for metric cruisers and Harleys. They also create show bikes. I'm not usually one for Harley customs, but the special all-in-one seat and tank on their "Trakker" showbike (above) really caught my attention. Riding technique is important. If you are not in the power band (6000 rpm up), twisting the grip to full throttle is not useful, and actually just helps foul the plugs. Be very patient and wait, or shift gears, until the engine gets to at least 5000 before hitting wide open. Otherwise you are just dumping extra oil into the cylinders and ruining your plugs. 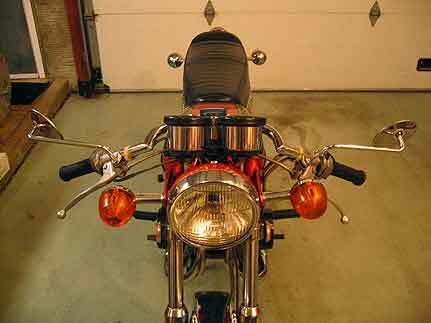 The mufflers are too restrictive even when absolutely clean. They rapidly strangle the machine as they plug up with oily soot. So you need to drill a couple of holes about one eighth or 3/16 of an inch in diameter in the end of each baffle so some exhaust gas can bypass the baffle. It's best to not drill in the chrome area, just beside the exit hole is OK. Then you have to keep the baffles pretty clean, and maybe make a scraping tool to clean them out without always having to remove them. A long screw was what I used. (about 10 inches) I used it kind of like a little rake to scrape out the baffle. Metallic ash can foul the spark plugs. There are two sources of this, one is leaded gas, which you can't find any more so no worries there. 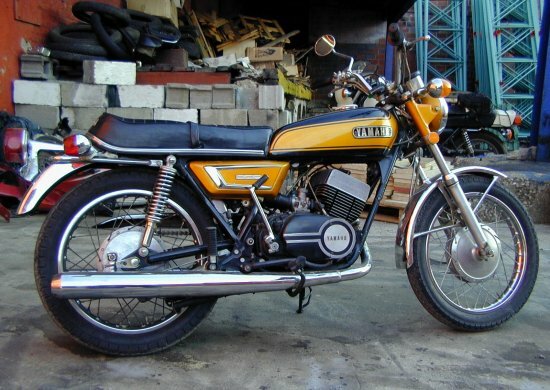 The second source is the 2 stroke oil. Yamaha says use oil "BIA Certified for service TC-W" I don't even need to look that up, 20 years later it's still engraved in my memory. Actually, you sometimes can't find this stuff but what you are looking for is "Ash free" oil. You can check the label. The DS7 ran with lots of oil, and that what partly contributed to fouling but also made the engine last a long time under severe use. More information and plenty of pictures here. After a few months of searching, I was finally able to locate a mount for the stock R5 right-hand mirror I picked up. It didn't quite fit, but with a little Loctite and some swearing I made it work. I can finally see behind me! The stock left mirror that came with my bike is convex, so it gives me a greater viewing area on my passing side, while the right mirror is flat and just gives me a direct view of what's behind me. Nonetheless, it's already been a great help. You can also view the mirrors in my R5 Flikr set. 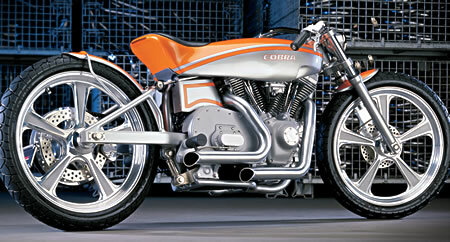 Last week, the Kneeslider posted an article about the beauty of Ron Wood's dirt track motorcycles. There was mention in the article that no one was building these for the street. I posted in the comments that, with a little help from Moto Carrera, you can turn a Yamaha R5/RD350/400/RZ350 into a "street tracker", combining the sleekness of a dirt track racer with the practicality of a street-legal road bike. So they then went a did a little write up about it. Thanks for the shout-out guys! Gotta love the piston steering cap and hood ornament. And to think, it's one of twenty! Do we really need that much coverage of cars turning left? PLEASE PLEASE PLEASE sign this petition to increase the broadcast of non-NASCAR related programming on SPEED. There's so much more to motorsports than just 300+ miles of sponsor-stickered cars turning left. And a hundred shows about the process and drama of 300+ miles of sponsor-stickered cars turning left. And a hundred shows with people talking and analyzing the process and drama of 300+ miles of sponsor-stickered cars turning left. Hey everyone! More site updating! After a few people wrote in about having some trouble with the old wonky subscription service for this site, and after listening to some glowing reviews of a new(er) service in action (on a podcast from the guys at White Roof Radio), I've aligned my blog with FeedBurner to bring you a new RSS subscription option. You'll see the new link in the sidebar, with a shiny orange icon next to it. So... what's all this fancy RSS stuff, you ask? Well, it's an easy way to stay on top of what's going on here (and many other sites to which you can subscribe). Confused? Get a better handle on the whole RSS thing here. If you'd rather not get into the whole newsreader thing, and you'd still like to subscribe, you can always sign up via email. Just enter your address is the field located below the RSS button in the "Subscribe" section of the sidebar, and that's it! TONS OF TOOLS AND EQUIPMENT! But if you'd rather just pick up a whole collection at once, check out this auction for an entire museum. For a listing of the collection, visit the MidAmerica Auctions site.